Apartment rents for new leases in King and Snohomish counties jumped nearly 5 percent in the second quarter and almost 10 percent over the past 12 months, according to a new survey. In the second quarter, the average rent for new leases was $1,405, up $124 from a year ago, market-research firm Apartment Insights Washington reports. The firm tracks rents, vacancies and concessions at apartment complexes with at least 50 units. The annual rent increase for the latest period was the largest seen locally since Apartment Insights began tracking the market in 2005. It also is well ahead of the national average: Texas-based MPF Research said U.S. apartment rents soared in the second quarter and climbed 5.2 percent annually, a 15-year high. “While apartment rents are rising at a significant pace all across the country, the nation’s average price increase is being skewed quite a bit by the surging rents in the Western region of the country,” said Greg Willett, MPF’s vice president. “Throughout the current economic cycle, the nation’s rent-growth leaders have been in the Pacific Northwest, from Seattle down through the San Francisco Bay Area, plus Denver,” Willett said. Rents now are accelerating in Southern California, Phoenix, Las Vegas and Sacramento, he added. The Seattle metro area ranked sixth nationally in annual rent growth in the second quarter in MPF’s study. Another market-research firm, New York-based Reis, ranked King, Snohomish and Pierce counties’ region 15th in rent growth. San Jose, San Francisco and Denver led all metro areas in rent hikes in Reis’ study. The national boom in apartment construction should have slowed the pace of rent increases, Willett said, but that’s not happening because the new buildings have luxury finishes and amenities. For example, at the 31-story Cielo apartments at 800 Seneca St., more than half of the 335 units are leased. The building, which opened in January, has a dog-washing station, fitness center and top-floor terrace and wine bar, among other amenities. It recently asked $2,090 in rent for a one-bedroom unit, plus $195 to $250 for a spot in the parking garage; utilities aren’t included. Apartments of all sizes in downtown Seattle rent for an average $2,226, or $2.72 a square foot, the highest of all the area’s submarkets, according to Apartment Insights. 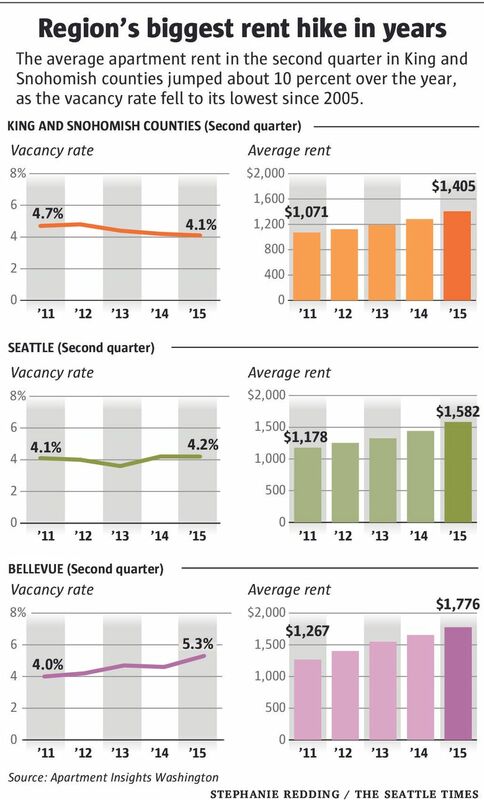 In Seattle overall, the average rent was $1,582, 10 percent higher than a year ago. In Bellevue, the average was $1,776, about 7 percent higher. SeaTac had the region’s lowest average rent among urban submarkets: $972, or $1.24 a square foot. Market observers had expected apartment rent growth to ease this year as new buildings opened, but job growth was stronger than they expected — and with higher demand for apartments, the vacancy rate fell further. The second quarter’s vacancy rate in King and Snohomish counties was 4.05 percent, down from 4.17 percent a year ago, reports Apartment Insights. “This is the all-time low since we began surveying this rental market in 2005,” said Tom Cain, principal of Apartment Insights, in a news release. In certain areas with a big jump in apartment supply, like Seattle’s Ballard neighborhood, the vacancy rate was 6.9 percent and the average rent barely changed over the past three months but grew 3.6 percent over the year. The region’s average rent declined during the last recession, falling 2 percent annually in 2009 and another 1.6 percent in 2010, but has risen each year since. Cain says there are 23,000 apartment units under construction in King and Snohomish counties.